The 7th Grade Division of the Clash For The Cup produced some of the best talent in the region. Here’s Part 2 of our top performers from the event. 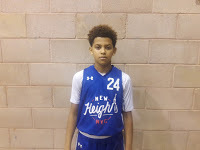 Dylan Seay Guard (NY Rens)- Dylan had a big weekend for the NY Rens. He’s a natural matchup problem because of his size. He also shoots the rock with good accuracy from the perimeter. I like when he is flowing with aggression and attacking the defense. His game definitely stood out in our eyes. He drained 3 treys against Riverside Hawks in the semifinals. 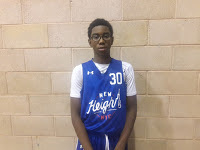 Dante Green Guard (NY Rens)- Green also was a big plus for the weekend. The shooting guard showed the ability to dribble past defenders and convert in traffic. He also has a mean ratchet and shouldn’t be left opened. He came up big in their semifinal loss to rival Riverside with 18 markers including 2 treys. Christian Bliss Guard (NY Rens)- Bliss came out a little anxious against his former team in the semi-finals but then settled down and orchestrated the attack. His dribble drive game was apparent and I love his vocal skills in terms of coaching his teammates on the floor. His best scoring output was 13 points against East Coast Elite. His leadership helped them reach the final four. Imeru McManus Forward (New Heights)- It’s a good coincidence that McManus wears #44 because his game is similar to former NBA start Brian Grant. Imeru is a little undersized as a true power forward but his warrior style cannot be denied. He uses speed and power to score buckets and hit the boards. He averaged double figures in scoring helping them reach the semi-finals. 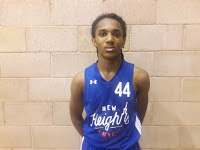 Jaiden Williams Forward (New Heights)- “The Worm” once again led the team in scoring over the weekend. His versatility is his biggest asset. He looked his best when he had the trey ball falling which often makes him difficult to maintain. He scored 18 points against We R 1 and 15 markers versus the Gauchos. Kenny Satterfield Jr. Guard (New Heights)- Satterfield wasn’t as hot from the outside as he was at the Tip Off Classic but was still able to drained some big trey balls over the weekend. His outside shooting is crucial to New Heights success.